they've fenced off the lower portion of uiskentuie strand; only on the right hand side as you're heading towards bruichladdich on the port charlotte road, but it at least restricts cattle movements across that part of the road, though if the sheep had any sense (which they don't), they could still sneak under the rather sparse wiring. it was, in fact, just past this section, a tad closer to the foreland turn-off that the rather excellent notion occurred, somewhat like archimedes' 'eureka' moment. i'd made it over the hill at blackrock, past the turn for the rspb reserve at gruinart and on past the jumble of whitewashed buildings that constitute uiskentuie farm. i quite often, at this point, flip onto the grass if on the cyclocross bike, but this time, it was still cosily ensconced in its portion of the bikeshed. at the point of my stunning revelation, the fence was not yet completely in place; the jcb with attachment for popping fenceposts into the ground in one fell swoop still sat by the old disused road leading up towards foreland house and the cows ambled about, obviously oblivious to their impending corraling. i was riding a shand skinnymalinky, fitted with derek mclay's wheelsmith race 23s and dressed head to toe in apparel from edinburgh's endura clothing. if the groat has not yet dropped, i was essentially, made in scotland. yes, tyres, groupset, components and english leather saddle came not from north of the border, but being realistic, there's little chance of that ever being the case. however, basically speaking, if you'd sliced me in half at that very moment (not a personal invitation, you understand) i would have had the words made in scotland written all the way through. quite obviously, my counterpart in tuscany (scary thought), luigi could have been having similar thoughts, speeding past the vineyards on his campagnolo equipped colnago on vittoria tyres and selle san marco saddle clad in a mixture of castelli and santini. but italy has a history of this, and no-one would give a fig for luigi's eureka moment. mine, on the other hand, was not just a fleeting thought, but one reinforced by the fact that bike, wheels and clothing were/are all world class. i have already reviewed both the skinnymalinky and the wheelsmith race 23s (though there will be more concerning the latter in the coming months), and i've not left endura in the cold over the years. if that were all that were the cause of my revelation, i might well have kept its secret to myself. imagine my stepping into debbie's of a saturday lunchtime, eager for a cheese and tomato toastie and some chocolate dusted froth, regaling all and sundry with the details of my bicycle and apparel. you can almost hear the disinterest clamouring from each table and bar stool. but it could well be that we dour scots take all this for granted. not, i mean to say, that we are not world class, but arrogance is not usually a feature for which the scots are renowned, but perhaps we're disturbingly naive when it comes to taking in the big picture. as a for instance, and one of many that i'm about to impose upon your reading pleasure, that shand skinnymalinky, aside from being truly one of the finest bicycles i have ridden, and one that would have impressed luigi in tuscany, was, as steven said " a road frame that was durable, comfortable, had clearance for 'bigger' tyres and mudguards and above all was practical for the kind of riding we do here in the UK, and more specifically, Scotland.". click back just a few words and take in the sensibility that the frame had clearance for mudguards, something of a necessity for the resulting scottish riding. though skinny, slinky road bikes have a reputation for eschewing guards in favour of go-faster stripes, i think it necessary to remind you of the seminal quote from time-triallist michael hutchinson "mudguards are fashionable in the way that a brown muddy stripe up the back of your jersey isn't." in terms of remaining true to the scottish philosophy, the very finest are again available from scotland; edinburgh to be precise. for there, wooden furniture maker, simon muir (it's the furniture that's wooden, not simon) and his partner stacey, offer custom wooden mudguards with state of the art aluminium and steel hardware, made from recycled wood and featuring a coloured inner laminate of formica. good old scottish pragmatism at work. i have a pair of portland's fullwoodfenders on the cielo, but the fitting hardware on the woodguards knocks the american version into a cocked hat. stacey said "The steel hardware (brackets and clips) is by Velo Orange. We buy it in because it's far superior to the type of brackets you can buy generally. It is minimal, nice lines and well-crafted, and one of the only things we don't make in-house. 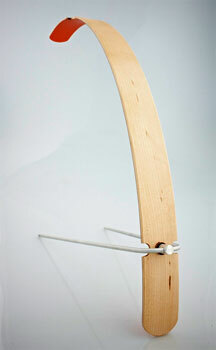 The aluminium for the stays is bought locally and bent and formed by Simon by hand. We use a local Edinburgh engineering firm to turn the aluminium stay-heads to ensure they are uniform and beautifully shaped. We buy leather washers from our friends at Soda Kitsch who make luggage and leatherware. 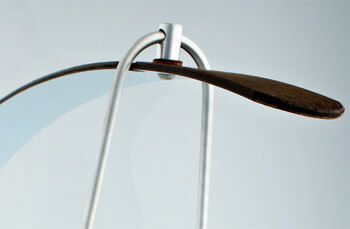 The leather washer prevents the aluminium from digging into the wood when it vibrates during a ride. the quality of the woodguards pretty much has to be seen to be believed; they look far too fragile to work, but in truth, they are anything but. 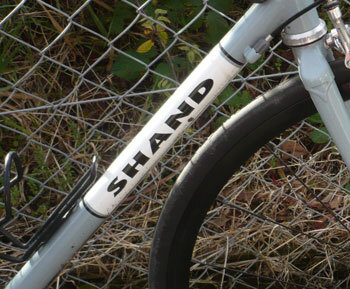 those two sets of rear stays and single front set are of a diameter and rigidity rarely if ever seen on a set of mudguards. "We're coming from a bespoke furniture background, so, every tiny detail has to be deliberate and functional as well as beautiful. The mudguards have cut-outs for the stays that are done by hand, as are the rounded ends on each pair. It takes on average four hours to make one pair. They're always made by Simon, and he always the same way using the same bonding emulsions and process. 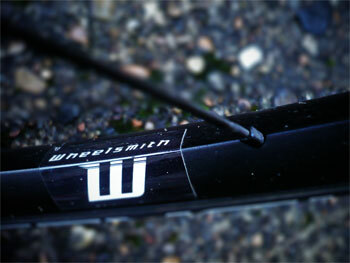 Each pair are as durable as the ones we have on our own bikes. We ride ours all over the place in any weather and they do a fantastic job of keeping us dry and being a talking point at whatever store, cafe or pub we lock our bikes up at. stacey agrees with my parochial assessment of these scottish endeavours "we think there is a burgeoning artisan scene is Scotland and that we need to focus our business on that aspect of our product." perhaps a tad superficially it is necessary to ally this physical craftsmanship with a high degree of visualisation in the graphical realm. 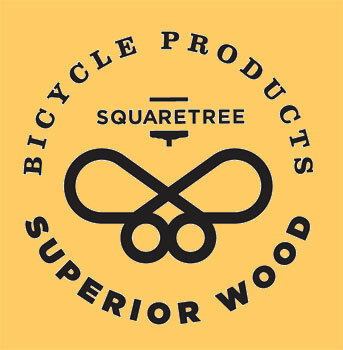 the pair of woodguards kindly sent for review were received from colin raeburn at graphical house, the glasgow design atelier responsible for squaretree's very impressive logo and associated graphic design "we are really proud of the woodguard graphics and love producing stuff for them.". keeping it local. none of the bicycle-related items i have paid tribute to so far inhabit the budget end of the spectrum, but as mentioned in my recent trakke mule bag review, we're looking at serious scottish craftsmanship that perhaps not collectively or consciously, is engendering not only a national cottage industry, but the ideal level of ambassadorship for the country, no matter the cycling connection. a pair of squaretree woodguards retails at £142 per set, only marginally more expensive that the portland product, but with substantially better hardware and craftsmanship. though i have only recently paid tribute to the skills being deployed at glasgow's trakke bags, it would be foolish to exclude them from this feature. for though many of us may flick through the pages of procycling, cyclist and cycle sport each month, paying indifferent attention to the lycra clad advertising hoardings on taiwanese carbon, the reality is seriously different for the majority. there is no chance whatsoever that i will even begin to approximate that particular genre, and i believe that's true for most of us. that said and accepted, it's time to embrace a reality that is every bit as involving if just a few kph slower, and a reality that frequently has to carry stuff from a to b. dressed in endura's urban wear, riding shand and wheelsmith with a trakke mule bag is a sentence that could not have been so casually thrown into my narrative even ten years ago. and what of endura themselves? the afforementioned urban range offers the chance to appear 'normal', but though those kilometres of speed are further away than ever, it doesn't stop a sizeable number of us still reaching for the lycra and polyester, currently in the shape of a bowmore distillery jersey. 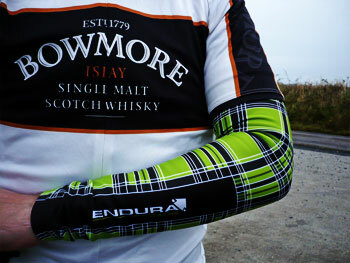 for me, that brings the scottish connection right to my back door, and in praise of former endura team rider jonathan tiernan locke's triumph in the recent tour of britain, the folks in livingston have produced a traditional pair of tartan armwarmers and collar to match that bowmore jersey. and what does it say inside the collar of the latter? made in scotland. i have, on two occasions, visited the fair city of portland in oregon state; america's pacific northwest. the town is one of the most marvellous and exciting to visit for anyone with more than a passing interest in cyclings as either a sporting activity or viable means of transport. though i am here talking about a city the size of edinburgh rather than an entire country that has a population some three million less than that of london, but from my point of view, there are parallels beginning to appear. one frame builder compares badly against portlands rumoured 25, though wheelbuilders seem to be in greater supply up here with both derek at wheelsmith and big al at wheelcraft. i can only refer to jude at sugar in portland. however, small beginnings and the right mindset seem a good start. perhaps a bit belatedly, and an occasion when it would be eminently possible to dress in those endura tartan armwarmers, this friday will celebrate st andrews day with a tartan ride across glasgow city. having had the tweed ride originate in london town several years ago, and now franchised across many parts of the world, i think it only indicative of the scots being slightly backward in coming forward that it has taken us this long to hold our own homespun version. 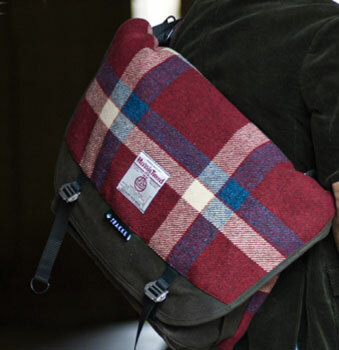 though trakke bags offer harris tweed versions and but three miles from washingmachinepost cottage is the islay woollen mill weaving its own tweeds, it's tartan that often identifies the country. it's yer other national fabric. allow me perhaps to place cycling life in a more modest, yet optimistic future, and it again brings population into the equation. islay is home to around 3,500 people, with a regular cycling peloton of around four on a good day. yet we have a cafe in bruichladdich that has its own cycling corner, the vulpine christmas fete is advertised in the window, it features an original photograph of bradley wiggins by the esteemed, edinburgh-based photographer, scott mitchell, and a worldwide reputation that has had cyclists from america placing it on their islay itinerary. 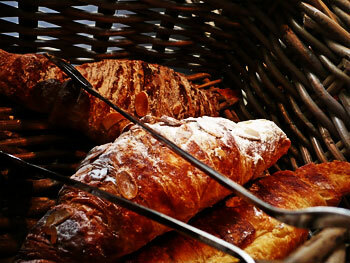 and a cup of coffee to die for. 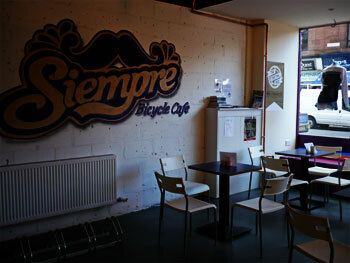 though we claim this as scotland's first of the genre, it has been successfully copied (inadvertantly of course) firstly by ronde in hamilton place, edinburgh, and more recently by velocity cafe and bicycle workshop in inverness, and that of siempre in glasgow's dumbarton road. all of these, including debbie's, have styled themselves as cycling cafes, obviously enough happy to serve civilians too, but catering to those who'd like to sup froth and munch carrot cake while dressed in lycra and reading last week's copy of the comic without being the subject of sniggering and mentally pointing fingers. but perhaps more expansively, if you are at all geographically aware, take a quick look at the locations mentioned above. way out west, we have debbie's; on a similar latitude is siempre in glasgow, and all the way across on the other side of scotland, is ronde in edinburgh. inverness is in the little nook at the northernmost tip of the great glen; the caledonian fault-line. loch ness is pretty close by. if we have a quick shot at join the dots, starting and finishing at bruichladdich, the resulting shape describes a triangle that encompasses the bulk of the scottish mainland and an important part of the inner hebrides, proving, if nothing else, that scotland's nascent cycling scene has little or nothing to do with the professional peloton, but everything to do with its very own cycling culture. ok, so coffee is hardly an indigenous product, but that is an accusation that could be levelled at other corners of the united kingdom and even portland. and it is cycling and scottish carrots in the cake we're talking about here. oh, and that mention of scotland having nothing to do with the professional peloton; that was a lie. drop in at edinburgh's ronde on a coincidental part of the week, and you could easily be sharing your wooden table with the king of scotland. they don't have one of those in portland.